How Should Christians Respond to the False Gods of the New Atheists? Ted notes: This clever image (source) of a non-existent “First Church of Rational Thought” accompanies an article recommending that atheists practice “Paganism”, by atheist blogger John Halstead. 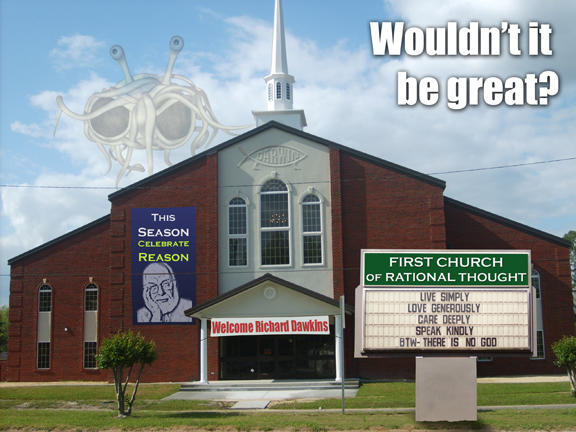 The iconography includes some of the saints and gods of the New Atheists, including the Darwin fish under the steeple, a banner welcoming Richard Dawkins, a call to “celebrate reason,” and the flying spaghetti monster hovering in the clouds above. In this essay, I have identified seven characteristics and arguments of the New Atheism. As I stressed in the introduction, these do not exhaust the features and arguments of the New Atheism, but rather give an indication of the general tenor and tendencies of the movement.The analysis I have brought to bear in this essay is essentially the same as the approach I take when lecturing on the New Atheism in my science and religion courses. Here as in the university classroom (where the students range from atheist and agnostic to spiritual and religious), I want to provide an evaluation that will work for non-believers as well as believers. My basic point is that the New Atheists—so scathing in their attacks on religion, so full of righteous indignation and so intolerant of hypocrisy, bad arguments and factual error—are by no means without sin themselves. They are certainly in no position to cast the first stone. These seven stances of the New Atheism are amongst their most cherished gods. The rhetorical force of these arguments cannot be denied, but as they come under increasing scrutiny from various observers (including moderate atheists), these arguments will be shown to be much less forceful than their advocates imagine or want us to imagine. Whether they become widely recognised as false gods depends to a large extent on whatever cultural hegemony emerges in the coming years. The New Atheists are fond of pointing to what they see as the mythology and fictions of religion, especially Christianity. Now, over a decade into their campaign, it has become clear that they are themselves guilty of promoting myths and fictions of their own. Some readers—and not merely partisans of the New Atheism—may imagine that this movement has played a decisive role in what appears to be a measurable decline in Christianity in the Western world. It seems reasonable to conclude that the New Atheism has played some role here, but it should not be overstated. Insofar as there has been a decline in church membership, especially among mainline Protestants, other factors loom large. Increasing materialism deadens the spirit; careers provide incessant pressure; busyness suffocates many people’s lives; portrayals of religion in the media and pop culture produce a constant barrage of negativity; we face growing taboos about religion in culture, the school system and the academy; a reinforcing Christian worldview in society gradually retreats; and, the same social safety net (itself to some extent a result of religious beliefs) that brings improved health care, greater life expectancy, and a sense of well-being can also decrease the need for social action by churches. People today have far more options for Sunday activities than just attending church. Television, the internet, shopping, Sunday morning little league games, and many other things vie for their attention. More people today believe they have more to hope for outside the bounds of religion. At the same time—and here there is need for some deep soul-searching on the part of practising Christians—the Christian religion has provided numerous examples of bad behavior, double standards, criminality, financial scandals, abuse cases of various kinds, cover-ups and the like. While it is true that Christians are no less human than anyone else, it is also true that many scandals have not been fairly contextualized by the media and that religious leaders are regularly held to higher standards than (say) school teachers, hockey coaches, actors, pop stars and scientists. (Many Christians would say that this is as it should be.) It remains the case that Christians have provided the New Atheists with some of their best arguments for unbelief, when they fail to uphold the Gospel’s teachings about truth, justice, morality and self-sacrificing love. It may well be that Christians have done more to engender unbelief than atheists active in the media. Yes, the New Atheists have helped erode Christianity’s important cultural position in the West, but they should not be given credit for the effects of the more powerful causes outlined above and many others equally powerful that remain unmentioned. Whatever role they have played in loss of faith, it would have been smaller yet had more people turned against New Atheists the same penetrating kinds of critique New Atheists have directed against Christianity and religion. Those who do will discover that many of the arguments that at first glance appear to have firm foundations are in fact built on sand. For both believers and those who study the history of science and religion, the New Atheists might seem like a curse—or, to use a biblical expression, a thorn in their sides. Certainly their caricatures of religion, their angry rhetoric, and their impoverished historical understanding of the role religion has played in science have done great damage. This series has attempted to counter some of this damage. At the same time, not all of their arguments are wrong. Believers may find that they agree with some criticisms of abuses of religion. Others are criticisms of caricatures of God and faith that religious people themselves can encourage: Christians can introduce curses on their own faith and be thorns in their own sides. It is better to see the New Atheism in a positive light as an opportunity for believers to clarify what faith is and who God is and an opportunity for scholars to correct misunderstandings of the history of science and religion. It is also an opportunity for believers to examine themselves: believers can cheapen Christianity, just as the New Atheists tarnish science. Believers can engage in caricature, angry rhetoric and intolerance. Because of its pervasiveness, the New Atheism provides a ready opportunity to bring clarity, to do soul-searching before casting the first stone, and to rise to higher standards. In these senses, the New Atheism is not a curse, but a blessing. I thank Dr. Snobelen for working with me so conscientiously for the past few months on his series. An earlier version of this essay was published as Stephen D. Snobelen, “Science, Religion and the New Atheism,” in The New Atheism, ed. Susan Harris (Charlottetown: St. Peter Publications, 2013), pp. 109-44. BioLogos and the author are grateful to St. Peter Publications (the only source for purchasing this book) for permission to publish this updated, expanded version online. Ted recommends three book-length studies of the ways in which New Atheists present science, religion, and their own religion of science to large audiences: Oracles of Science: Celebrity Scientists Versus God and Religion (2007), by physicist Karl Giberson and philosopher Mariano Artigas; Dawkins’ God: Genes, Memes, and the Meaning of Life (2004), by theologian Alister McGrath; and, The New Atheists: The Twilight of Reason & the War on Religion (2007), by theologian Tina Beattie.